Not to be confused with UNITAS. For the Italian newspaper, see L'Unità. The National Union for the Total Independence of Angola (UNITA) (Portuguese: União Nacional para a Independência Total de Angola) is the second-largest political party in Angola. Founded in 1966, UNITA fought alongside the Popular Movement for the Liberation of Angola (MPLA) in the Angolan War for Independence (1961–1975) and then against the MPLA in the ensuing civil war (1975–2002). The war was one of the most prominent Cold War proxy wars, with UNITA receiving military aid from the United States and South Africa while the MPLA received support from the Soviet Union and its allies. UNITA was led by Jonas Savimbi from its foundation until his death in 2002. His successor as president of UNITA is Isaías Samakuva. Following Savimbi's death, UNITA abandoned armed struggle and participated in electoral politics. The party won 51 out of 220 seats in the 2017 parliamentary election. Jonas Savimbi and Antonio da Costa Fernandes founded UNITA on 13 March 1966 in Muangai in Moxico province in Portuguese Angola (during the Estado Novo regime). 200 other delegates were present in the event. UNITA launched its first attack on Portuguese colonial authorities on 25 December 1966. Savimbi was originally affiliated with Holden Roberto's National Liberation Front of Angola (FNLA). UNITA later moved to Jamba in Angola's southeastern province of Cuando Cubango. UNITA's leadership was drawn heavily from Angola's majority Ovimbundu ethnic group and its policies were originally Maoist, perhaps influenced by Savimbi's early training in China. They aimed at rural rights and recognized ethnic divisions. In later years, however, UNITA became more aligned with the United States, espousing support for capitalism in Angola. After the Portuguese withdrawal from Angola in 1974–75 and the end of their colonial rule, the MPLA and UNITA splintered, and civil war began as the movements clashed militarily and ideologically. MPLA leader Agostinho Neto became the first president of post-colonial Angola. Backed by Soviet and Cuban money, weapons and troops, the MPLA defeated the FNLA militarily and forced them largely into exile. UNITA also was nearly destroyed in November 1975, but it managed to survive and set up a second government in the provincial capital of Huambo. UNITA was hard-pressed but recovered with South African aid and then was strengthened considerably by U.S. support during the 1980s. The MPLA's military presence was strongest in Angolan cities, the coastal region and the strategic oil fields. But UNITA controlled much of the highland's interior, notably the Bié Plateau, and other strategic regions of the country. Up to 300,000 Angolans died in the civil war. In the 1980s and early 1990s, Savimbi sought out vastly expanded relations with the U.S. He received considerable guidance from The Heritage Foundation, an influential conservative research institute in Washington, D.C. that maintained strong relations with both the Reagan administration and the U.S. Congress. Michael Johns, the Heritage Foundation's leading expert on Africa and Third World Affairs issues, visited Savimbi in his clandestine southern Angolan base camps, offering the UNITA leader both tactical military and political advice. In 1986, U.S. conservatives convinced President Ronald Reagan to meet with Savimbi at the White House. While the meeting itself was confidential, Reagan emerged from it with support and enthusiasm for Savimbi's efforts, stating that he could envision a UNITA "victory that electrifies the world," suggesting that Reagan saw the outcome of the Angolan conflict as critical to his entire Reagan Doctrine foreign policy, consisting of support for anti-communist resistance movements in Central America, Southeast Asia, and elsewhere. Under Savimbi's leadership, UNITA proved especially effective militarily before and after independence, becoming one of the world's most effective armed resistance movements of the late 20th century. According to the U.S. State Department, UNITA came to control "vast swaths of the interior (of Angola)". 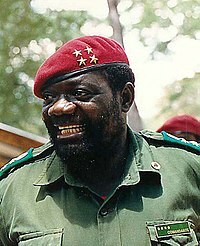 Savimbi's very survival in Angola in and of itself was viewed as an incredible accomplishment, and he came to be known as "Africa's most enduring bush fighter" given assassination attempts, aided by extensive Soviet, Cuban, and East German military troops, advisors and support, that he survived. As Savimbi gained ground despite the forces aligned against him, American conservatives pointed to his success, and that of Afghan mujahideen and the Nicaraguan contras, all of which, with U.S. support, were successfully opposing Soviet-sponsored governments, as evidence that the U.S. was beginning to gain an upper hand in the Cold War conflict and that the Reagan Doctrine was working. Critics, on the other hand, responded that the support given to UNITA, the contras, and the Afghan mujahideen was inflaming regional conflicts at great expense to these nations. Furthermore, UNITA, like the Angolan government it fought, was criticized for human rights abuses. UNITA gained some international notoriety in 1983 after abducting 66 Czechoslovak civilians and detaining a third of them for about 15 months. Belgium eventually negotiated the release of the civilians. Fighting in Angola continued until 1989, when, with UNITA advancing militarily, Cuba withdrew its support, removing several thousand troops that it had dispatched to Angola to fight Savimbi's UNITA. With many commentators and foreign policy specialists seeing that the Cold War might be drawing to an end, Savimbi's U.S. support, which had been strong, began to be questioned, with some in Congress urging the end of U.S. support for UNITA. Matters were further complicated by repeated reports that Soviet General Secretary Mikhail Gorbachev had raised U.S. support for UNITA in several formal and informal summit meetings with President George H. W. Bush, placing further pressure on the U.S. to end its support for UNITA. As the war began to include both military and diplomatic components, Johns and leading U.S. conservatives urged Savimbi to make a ceasefire contingent on the MPLA's agreement to "free and fair elections." When the UNITA demand was originally rebuffed by the MPLA, Savimbi vastly intensified his military pressure, while alleging that the MPLA was resisting free and fair elections because they feared a UNITA electoral victory. Meanwhile, an agreement was reached that provided for the removal of foreign troops from Angola in exchange for the independence of Namibia from South Africa. In Angola, however, Savimbi told Johns and conservative leader Howard Phillips that he had not felt adequately consulted on the negotiations or agreement and was in opposition to it. "There are a lot of loopholes in that agreement. The agreement is not good at all," Johns reported Savimbi telling both of them during a March 1989 visit with Savimbi in Angola." A ceasefire ultimately was negotiated and MPLA leader José Eduardo dos Santos and the MPLA's Central Committee rejected its Marxist past and agreed to Savimbi's demand for free and fair elections, though UNITA and its supporters viewed the promises skeptically, especially because the MPLA's relations with the Soviet Union remained strong. Following the 1991 Bicesse Accords, signed in Lisbon, United Nations-brokered elections were held, with both Savimbi and dos Santos running for President in 1992. Failing to win an overall majority in the first round of balloting, and then questioning the election's legitimacy, Savimbi and UNITA returned to armed conflict. Fighting resumed in October 1992 in Huambo, quickly spreading to Angola's capital, Luanda. It was here that Jeremias Chitunda, UNITA's long-time vice-president and other UNITA officials were killed while fleeing the city culminating in the Halloween Massacre. Following Chitunda's death, UNITA defensively moved their base from Jamba to Huambo. Savimbi's 1992 decision to return to combat ultimately proved a costly one, with many of Savimbi's U.S. conservative allies urging Savimbi to contest dos Santos electorally in the run-off election. Savimbi's decision to forego the run-off also greatly strained UNITA's relations with U.S. President George H. W. Bush. As Savimbi resumed fighting, the U.N. responded by implementing an embargo against UNITA through United Nations Security Council Resolution 1173. The UN-commissioned Fowler Report detailed how UNITA continued to finance its war effort through the sales of diamonds (later to be known as blood diamonds) and resulted in further sanctions in the form of United Nations Security Council Resolution 1295 and action to end to the trade in blood diamonds through the Kimberley Process Certification Scheme. The U.S. government, which had never recognized the legitimacy of the MPLA, finally recognized the Angolan government, further alienating Savimbi. After failed talks in 1993 to end the conflict, another agreement, the Lusaka Protocol, was implemented in 1994 to form a government of national unity. In 1995, U.N. peacekeepers arrived. But UNITA broke away from the Lusaka agreement in 1998, citing violations of it by the MPLA. In late 1998, a militant group calling itself UNITA Renovada broke away from mainstream UNITA, when several UNITA commanders dissatisfied with the leadership of Jonas Savimbi ended their allegiance to his organization. Thousands more deserted UNITA in 1999 and 2000. In 1999, a MPLA military offensive damaged UNITA considerably, essentially destroying UNITA as a conventional military force and forcing UNITA to return to more traditional guerilla tactics. The Angolan civil war ended only after the death of Savimbi, who was killed in an ambush on 22 February 2002. His death was shocking to many Angolans, many of whom had grown up during the Angolan civil war and witnessed Savimbi's ability to successfully evade efforts by Soviet, Cuban and Angolan troops to kill him. Six weeks following Savimbi's death, in April 2002, UNITA agreed to a ceasefire with the government. Under an amnesty agreement, UNITA soldiers and their families, comprising roughly 350,000 people, were gathered in 33 demobilisation camps under the "Program For Social and Productive Reintegration of Demobilized and War Displaced People". In August 2002, UNITA officially gave up its armed wing, and UNITA placed all of its efforts on the development of its political party. Despite the ceasefire, deep political conflict between UNITA and the MPLA remains. Savimbi was immediately succeeded by António Dembo, who died shortly after Savimbi. Following Dembo, in elections contested by General Paulo Lukamba, Dinho Chingunji and Isaías Samakuva, Samakuva won the UNITA election and emerged as UNITA's current president. UNITA received support from several governments in Africa and around the world, including Bulgaria, Egypt, France, Israel, Morocco, the People's Republic of China, Saudi Arabia, Zaire, and Zambia. During the Reagan administration high ranking security officials met with UNITA leaders. Central Intelligence Agency Director William J. Casey, National Security Advisor Richard Allen, and Secretary of State Alexander Haig, on 6 March met with Unita leaders in Washington, D.C. Assistant Secretary of State for African Affairs Walker met with Savimbi in March in Rabat, Morocco. Secretary of Defense Caspar Weinberger, his assistant for International Security Matters Francis West, Deputy Defense Secretary Frank Carlucci, Deputy Director of the CIA Bobby Inman, and Director of the Defense Intelligence Agency James Williams met with Savimbi between November 1981 and January 1982. Although the Clark Amendment forbid U.S. involvement in the civil war, Secretary Haig told Savimbi in December 1981 that the U.S. would continue to provide assistance to UNITA. The U.S. government "explicitly encouraged" the governments of Israel, Morocco, Saudi Arabia, South Africa, and Zaire to aid UNITA. In 1983 the U.S. and South African governments agreed to ship weapons from the Honduras, Belgium and Switzerland to South Africa and then to UNITA in Angola. The U.S. also traded weapons with South Africa for intelligence on the civil war. Savimbi benefited from the support of influential American conservatives, including The Heritage Foundation's Michael Johns and other U.S. conservative leaders, who helped elevate Savimbi's stature in Washington and promoted the transfer of American weapons to his war. Johns and other American conservatives met regularly with Savimbi in remote Jamba, culminating in the "Democratic International" in 1985. Savimbi later drew the praise of U.S. President Ronald Reagan, who hailed him as a freedom fighter and spoke of Savimbi winning a victory that "electrifies the world" while others hinted at a much darker regime, dismissing Savimbi as a power-hungry propagandist. ^ "Angola-Emergence of Unita". Retrieved 20 January 2015. ^ a b Obituary: Jonas Savimbi, UNITA's local boy, 25 February 2002. BBC News. ^ Kukkuk, Leon (2005). Letters to Gabriella. p. 156. ^ ""The War against Soviet Colonialism", by Jonas Savimbi, Policy Review, January 1986, pp. 18–25". UNZ.org. Retrieved 20 January 2015. ^ "Political background – Angola – area, power". Retrieved 20 January 2015. ^ a b "BBC News – Angola country profile – Overview". BBC News. Retrieved 20 January 2015. ^ Michael Johns, "Savimbi's Elusive Victory in Angola", Human Events (entered in Congressional Record), 26 October 1989. ^ David Aaronovitch. "David Aaronovitch: Terrible legacy of the Reagan years". the Guardian. Retrieved 20 January 2015. ^ "Angola". U.S. Department of State. Retrieved 20 January 2015. ^ "Angola: Key Figures". Telegraph.co.uk. 8 August 2002. Retrieved 20 January 2015. ^ "Angolan peace talks stall over alleged attempt to kill Savimbi", The Washington Post, 19 December 1993. ^ "Angola: Human Rights Watch Report, 9/26/99". Retrieved 20 January 2015. ^ "The Angola abduction | Radio Prague". Radio Praha. Retrieved 2018-11-15. ^ "Cuban troops begin withdrawal from Angola", History.com, 10 January 1989. ^ "Congress to Act Soon on Angola: Urgent Lobbying Needed", Association of Concerned Africa Scholars, 5 May 1989. ^ "U.S. and Soviets Bridge Gap on Conventional Weapons and Plan for Summit Soon; Bush Hails Accord", The New York Times, 2 June 1991. ^ Michael Johns, With Freedom Near In Angola, This is No Time to Curtail Unita Assistance, Heritage Foundation Executive Memorandum 276, 31 July 1990, as entered in U.S. Congressional Record. ^ Michael Johns, Savimbi's Elusive Victory in Angola, Human Events magazine, 26 October 1989, as entered in U.S. Congressional Record. ^ Michael Johns, Angola: Testing Gorbachev's 'New Thinking', The Heritage Foundation, 5 February 1990. ^ "Former Rebels in Angola Shun Unity Meeting". 22 November 1992. Retrieved 20 January 2015. ^ "Final Report of the UN Panel of Experts ("The "Fowler Report")". Global Policy Forum. 2000-03-10. Retrieved 2010-03-20. ^ Hodges, Tony. Angola: Anatomy of an Oil State, 2004. Pages 15–16. ^ "World briefing". 29 December 1999. Retrieved 20 January 2015. ^ Chris McGreal (27 December 1999). "Rebels lose former HQ to Angolan army". the Guardian. Retrieved 20 January 2015. ^ "Angolan rebel leader 'killed'". BBC News. Retrieved 20 January 2015. ^ "Angola opposition will contest election result". Telegraph.co.uk. 7 September 2008. Retrieved 20 January 2015. ^ Howe, Herbert M. (2004). Ambiguous Order: Military Forces In African States. p. 81. ^ AlʻAmin Mazrui, Ali (1977). The Warrior Tradition in Modern Africa. p. 228. ^ a b Wright, George (1997). The Destruction of a Nation: United States Policy Towards Angola Since 1945. p. 110. ^ "Congress.gov | Library of Congress". thomas.loc.gov. Retrieved 2017-07-06. ^ "BBC News – Africa – Obituary: Jonas Savimbi, Unita's local boy". Retrieved 20 January 2015. Alliances sometimes changed dramatically over the course of the wars. Some groups may be associated with multiple, ostensibly opposed factions.